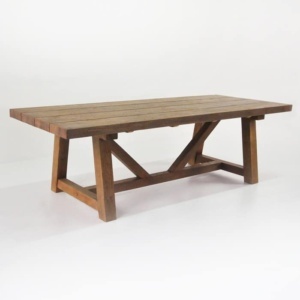 Rustic, extraordinary, and generous in size; the Grade-A Teak X-Leg Outdoor Dining Table adds a sturdy, classic and supportive feel to your outdoor area with the superb construction of thick planks of Grade-A Teak. Featuring a rectangular top with tightly placed slats of wood and large cross legs, this country style x-leg table looks fabulous with a more modern look such as a Raw Concrete Bench or some wicker Romansa Chairs. 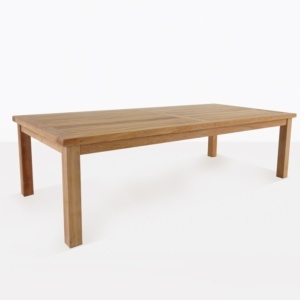 This Grade-A Teak X-Leg Outdoor Dining Table is available in 2 sizes. 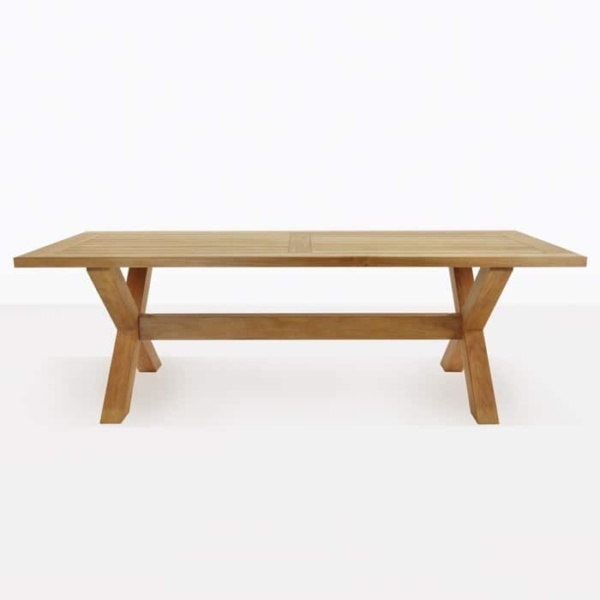 Whether you’re creating a modern feasting area bring in metals and concretes, or keeping it classic with an A-Grade Teak Bench the X-Leg Grade A-Teak Outdoor Dining Table will be the ideal focus point. Constructed entirely out of robust A-Grade Teak; the X-Leg A-Grade Teak Outdoor Dining Table adds a sturdy, classic and supportive feel to your outdoor area. A-Grade Teak refers to the age of the teak and how it is kilned. An A-Grade comes from a 40 plus year old teak tree; giving the wood a chance to develop its own rubber and oil content. This means that any furniture made from the wood will last longer than other woods outdoors. When it patinas to the pretty gray color (that we just LOVE!) it remains strong and durable against the aggressive elements. The X-Leg A-Grade Teak Outdoor Dining Table looks amazing in many spaces whether your dining table on patios, or perhaps in the midst of your flowers and long growing grass in the beautiful rural setting of your garden. This new X-Leg A-Grade Teak Outdoor Dining Table style incorporates rich country outdoor living design, with sturdy craftsmanship and construction. It walks the line between modern and traditional styles so well. Match our X-leg Tables with classic A-Grade teak chairs for a country look, or combine with modern wicker or our line of “plasteak” chairs for a contemporary, eclectic look. Available in 2 sizes so you can customize your look. These beautiful X-Leg A-Grade Teak Outdoor Dining Tables are perfect for commercial spaces. Have a new restaurant with a lush outdoor area? Fill your courtyard with the comfort of the epic 94” tables for family style meals your clientele will love! At Design Warehouse we have a dedicated team of staff who can assist you in designing the outdoor living space of your dreams! We work tirelessly to find the right combinations for each of our customers. 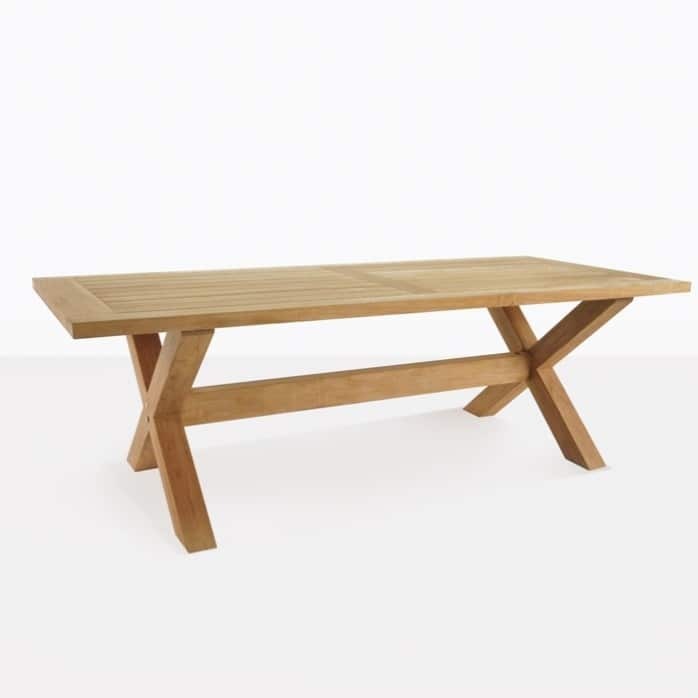 So whether you’re after something like the fabulous X-Leg A-Grade Teak Outdoor Dining Table or something lighter, or in a different material, or maybe you’re contemplating casual dining by way of deep seating, our sales staff will present all the options to you based on a perception of your style and space requirements. The X-Leg A-Grade Teak Outdoor Dining Table is a stunning, divine, and handsome outdoor dining table. We know you’ll adore it.